In 2002 I went on my first trip to the Dolomites with a friend. From that moment on there was no stopping me. In 2003 I went to the Alps, where I ascended quite a few peaks of over four thousand metres, one of which was Mont Blanc. I look back now and realise just how foolish I was to go up such mountains and cross glaciers alone, without adequate training and preparation. Everything turned out fine, but I do sometimes look back and think that anything could have happened. The mountains have given me a second chance to learn how to do things properly. In August 2003, on my return from the Alps, and I suppose with my hematocrit levels sky high, I took part in the “Subida Oroel” race in Jaca. This was my first hill run, and I did really well. It was then that I began to realise that mountain running was really my thing. In 2005 I took part for the first time in the Zegama-Aizkorri marathon. I finished tenth overall, and was the second Basque athlete to finish. It was my first time on the podium and I was really pleased. The experience somehow made me believe in myself and in abilities as a mountain runner. In 2006 I was selected to represent the Basque Country. I competed in the ‘Copa De España’ (The Spanish Cup) where I finished in third place behind two great runners – Raúl Garcia and Tofol Castañer. In 2007 the Basque national team asked me to compete in the World Cup, but at that moment in time I needed a break from competing. I still felt drawn towards the mountains, but in other ways. I wanted to try other things, get to know new mountains, climb them both in summer and in winter, try out other paths and climb mountains via more difficult but more aesthetically spectacular paths and arêtes. I thus began to do more climbing. In 2007 I had the opportunity to join an expedition to Broad Peak, the aim of which was to do the Baltoro Glacier Trek. I was amazed, overwhelmed by the enormity of these mountains which are over 6000, 7000 and even 8000 metres high. These mountains have a magnetic effect on people and I understand climbers who leave behind so much at home in order to try and ‘conquer’ them. Of course they can never be conquered, but the thrill of that moment of ecstasy, as you struggle to breathe due to the lack of oxygen at the summit, makes it all worthwhile. 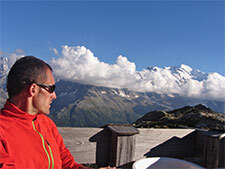 In 2008 I enjoyed an alpine summer with my partner Idoia. We set off with rucksacks on our backs containing everything that we needed and took a flight to Geneva. We spent 35 days trekking up and down Swiss, Italian and French valleys, climbing peaks of over 4000 metres and eating “Rosti” in mountain shelters. We climbed 15 peaks of over 4000 metres and soaked in the beauty and greatness of the Alps in all their glory. 2009 was the year when I began to compete again. A friend told me that in Beasain a 100 mile Ultra Trail was being organised, which crossed the most important mountains in Gipuzkoa, including Txindoki and Aizkorri. It meant that I would be competing again, but at a distance that I had never attempted, and I was attracted to the idea of putting myself to the test at this distance. I have to admit that when I stopped racing in order to do more mountaineering, I felt as if I had left some unfinished business behind – that of attempting the UTMB, or Mont Blanc Ultra Trail. 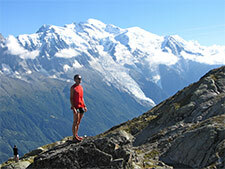 The UTMB is the ultimate long distance race in Trail Running. 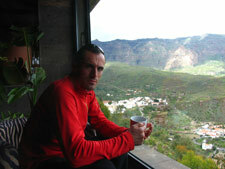 2010 was the year of the Ehun Milak Ultra Trail, a year of disappointment during which I learnt many lessons. I devoted myself to preparing for it, but perhaps I overdid things and went too far. When the start of the race finally arrived I was tired from so much training. When you find yourself in first place with an advantage of almost two hours over the runner in second place, and there is only a quarter of the race left to go but you are unable to continue, you have to make a really tough decision. It is not an easy call to make, you think about trying to carry on somehow, walking, dragging yourself along. However, I don’t take part in events like this to drag myself along or to put my health at risk. It was the correct decision to make and a lesson which I have thoroughly learnt. I finished the year on the podium in the Cavals del Vent Ultra Trail competing against world class runners, and this filled me with confidence for the future. In 2011 Salomon offered me the chance to become a member of the Spanish national team. I couldn’t believe it. Who would have thought it just a few years beforehand? I jumped at the chance to join such a great team, such a great establishment. Opportunities such as this only come along once in a lifetime. I began the season by pulling out during the first race. It was back to square one. I began to question many things, to reconsider stuff and make changes. It is when you fall flat on your face that you really learn important lessons. Amongst my goals for this particular year was the Mont Blanc Ultra Trail (UTMB), and this particular dream was within my grasp. Just to make the starting line was sufficient motivation in itself. The season has gone well, and I have enjoyed some special moments alongside Miguel Heras. The Mont Blanc Ultra Trail was one of the happiest days of my life. I feel as if one phase of my life has ended and that another, full of opportunities and challenges, has begun. This new phase involves discovering new horizons and new possibilities, but always in the mountains. This is where my life began, and via the mountains, with the mountains and through the mountains, I am steadily making my way in life, step by step.